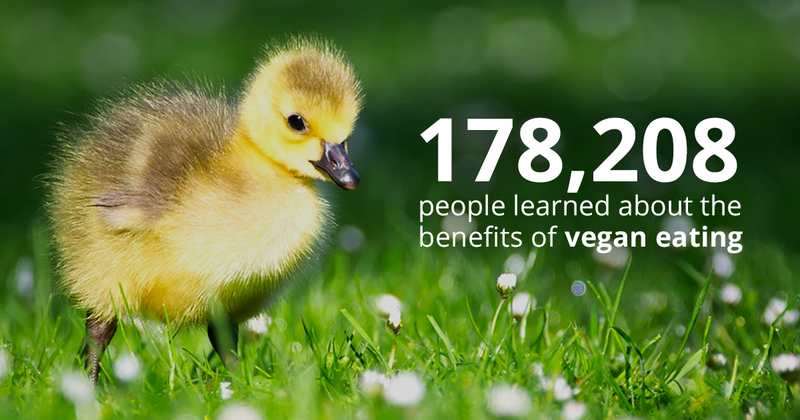 It’s been eight months since Better Eating first launched our first educational vegan ad campaign. Since then, we’ve added and changed target audiences, modified and improved the content, and continued to closely watch and record the results. Our video series reaffirm the viewers’ values — like caring about animals and the environment — before encouraging veganism, exposing animal agriculture, and promoting accessible plant-based options. In March, 178,208 unique people watched at least one video from one of our two series, totaling 315,936 completed views across our 30-second “pre-roll” sequential ads. Since the program’s launch, the videos have gathered a total of 2.9 million completed views from 918,00 unique viewers. 143,265 have been highly-engaged viewers — having stuck around to watch at least six consecutive videos for a total of 3 minutes of content. The ads are shown as pre-roll video on PopSci, Mashable, and dozens of other top websites. We’re also experimenting with placement on Connected TV’s — getting prime, full-screen placement while people watch TV shows and movies on their Roku, Chromecast, or other connected device. For both types of ads, we follow up with banner and display ads to encourage viewers to visit BetterEating.com. As we study responses and engagement, we continue to test, tweak, and improve our videos wherever necessary. In the coming weeks we’ll be debuting a series optimized for vegetarians motivated by personal health, and we’ll be unveiling new research about the types of audiences we’ll reach next.